For our not-so-little little brothers’ 15th birthday (yes, we have fraternal twin brothers), they requested this lemon cake. Or, we suggested this cake because it looked so good and they knew better than to disagree! The bad lighting doesn’t do this cake justice; it is one of the best cakes we’ve ever made. 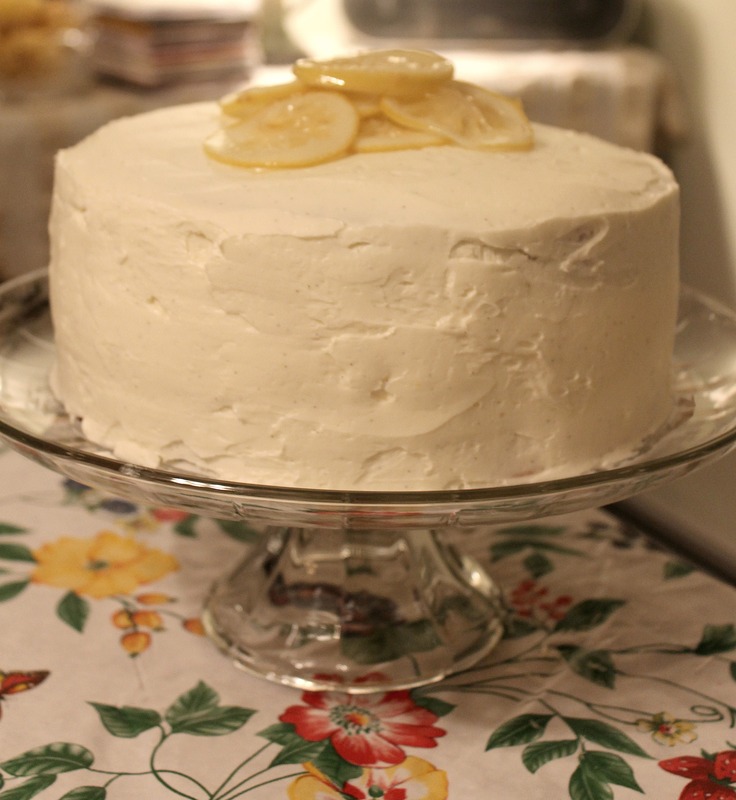 There is nothing that we would change about this recipe; the cake is velvety and the lemon mousse filling is to die for. It was fantastic! Also, the candied lemon slices on top were pretty easy to make and actually tasted surprisingly good. Sadly, there wasn’t much left after our family of 8 got a hold of it. Guess we’ll just have to make it again soon! Preheat the oven to 350° F. Butter and flour the edges of 2 9-inch or 3 8-inch round cake pans and shake out the excess. Line the pans with parchment paper. In a medium mixing bowl, combine the cake flour, baking powder and salt. Whisk together and set aside. Add the butter to the bowl of an electric mixer fitted with the paddle attachment. Add the lemon zest to the bowl of the mixer with the butter. Beat on medium-high speed for 3 minutes, until light and creamy in color. Scrape down the sides of the bowl and beat for one more minute. Add the sugar to the butter mixture, ¼ cup at a time, beating 1 minute after each addition. Mix in the eggs one at a time until incorporated. Scrape down the sides of the bowl after each addition. Combine the buttermilk and the lemon and vanilla extract in a liquid measuring cup. With the mixer on low speed, add the dry ingredients alternately with the wet ingredients, beginning and ending with the dry ingredients and mixing just until incorporated. Scrape down the sides of the bowl and mix for 15 seconds longer. Divide the batter between the prepared baking pans. Bake until golden and a toothpick inserted in the center comes out clean, about 20-22 minutes, rotating the pans halfway through baking. Let cool in the pans about 10 minutes, then invert onto a wire rack and let cool completely. To make the filling, combine the cream cheese and butter in the bowl of an electric mixer. Beat on medium-high speed until smooth and well combined. Mix in the confectioners’ sugar and beat on low speed until incorporated. Blend in the lemon extract and lemon zest. Increase the speed to medium-high and beat until light and fluffy, about 2 minutes. Transfer the mixture to a medium bowl and set aside. Wash the mixer bowl and fit with the whisk attachment. Add the heavy cream to the bowl and whip on high speed until stiff peaks form, being careful not to overbeat. Mix about a third of the whipped cream into the lemon-cream cheese mixture to lighten it. Gently fold in the remaining whipped cream until no streaks remain and the mixture is evenly blended. To make the frosting, add the butter to the bowl of an electric mixer fitted with the whisk attachment. Whip on medium-high speed until smooth, about 1 minute. Add the confectioners’ sugar to the bowl and mix on medium-low speed just until incorporated. Scrape the seeds from the vanilla bean pod into the bowl and add in the salt. Continue to beat on medium-high speed until smooth, about 1-2 minutes. Mix in the vanilla extract and heavy cream on low speed just until incorporated. Increase the mixer speed and whip on high speed until light and fluffy, scraping down the bowl as needed, about 4 minutes. To make the candied lemon slices, wash and dry the lemons thoroughly. Use a sharp serrated knife to make very thin slices of lemon. Poke out any seeds in the slices. Combine the sugar and water in a medium saucepan over medium-high heat. Heat the mixture until the sugar dissolves. Add the lemon slices to the mixture so that they are in a single layer (none overlapping), reduce the heat to medium-low and let simmer about 20 minutes, turning the slices at least once so both sides are candied. Remove from the heat. Store in a container with the syrup until ready to use. To assemble the cake, place one of the layers on a serving platter. Top with half of the lemon-cream cheese mixture and smooth in an even layer. Place a second cake layer on top of the filling and top with the remaining filling. Place the final cake layer on top. Frost the top and sides of the assembled cake with the vanilla bean frosting. Garnish with the candied lemon slices, draining them of the syrup.